In his magnum opus Waterworld, Kevin Costner’s character is introduced peeing into a machine that turns human urine into drinkable water. Now Costner has revealed that for the past 15 years he has been working on a similar machine in real life — and BP is interested. I ‘liked’ it and then decided to reblog it. Try it yourself if you have a WordPress.com blog, and would you leave a comment here to let me know what happens when you try it? I’d like to know how the reblog can go wrong without someone manually coding the feed to deliver the wrong article. Picked up your comment at Timethief’s post on the subject, so I tried your Kostner link, reblogged it and, like you, got something entirely different (a cat with artificial paws). I think it only works properly with WP blogs, though – that was my feeling, anyway. Just tried it with one of my own posts – that worked OK. I wonder if it’s a widespread “powered by” problem? 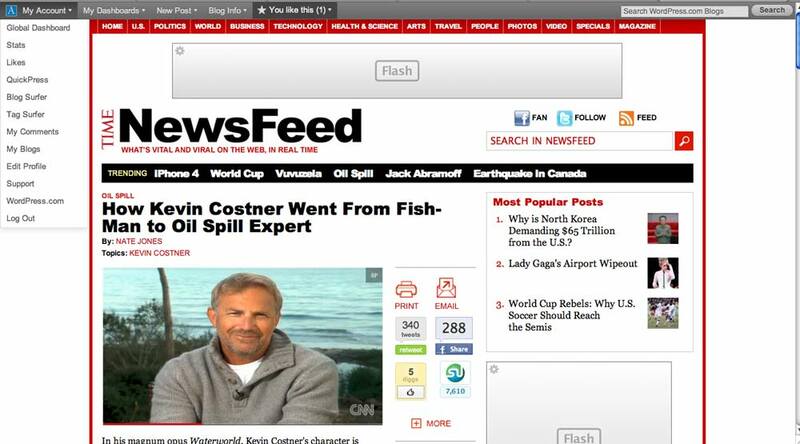 I tried it as well and got a reblog about “Will Tropical Storm Alex Hit the Oil Spill?” It seems to be pulling whatever the latest is from http://newsfeed.time.com/ rather than the individual article you are viewing. Ah, yes Richard, thank you. I tried the reblog just now and I can see that it is a redirection to whatever is the latest post rather than as I thought at the time, a redirection to a specific post. I have written to Support on the principle that so long as I can’t use the touted feature as intended (i.e. dictate which post I pull in) with the Time blog, then my WordPress installation is bugged even though the problem with the reblog feature may emanate from the code on another blog. It occurs to me that had I seen the Costner article and reblogged it when it was the latest article in the Time Feed, the reblogging would have pulled that in. What would then have happened to the wording on my article when the Costner article was no longer the latest article at Time? I expected: the Coster post to be pulled when I reblogged but in fact it is always whatever is the latest post from http://newsfeed.time.com/ that is pulled in. Hey – nice blog, just looking around some blogs, seems a pretty nice platform you are using. I’m currently using WordPress for a few of my sites but looking to change one of them over to a platform similar to yours as a trial run.